Posted by Drew Hause on November 22, 2018, 10:48 am, in reply to "Damascus bore dimensions?" Is your 00 1st year production at 1897 Travis? 2. It is not uncommon to find turn-of-the-century bores (presumed original) of .729 - .732". 3. I would suggest confirmation of your findings with another bore gauge. 4. A good "look" at the bore requires direct visualization with a bore scope. 5. Honing is entirely dependent on wall thickness (and the expertise of the smith!) and will make cleaning easier. It will do nothing for the recoil or pattern; other than tighten the pattern if the choke is not also relieved. 6. IF you do have a barrel specialist hone the barrels, it is my opinion (and others certainly will disagree) that lengthening the forcing cone to 1 1/2" or so would be reasonable. Doing so will do nothing to diminish recoil, but might improve the patterns. Because the angle of the cones is greater than the external taper of the barrel, wall thickness is usually greater in 12g at the cones compared to the end of the chamber. This may not apply to small gauge barrels. Posted by Travis Smith on November 23, 2018, 9:35 am, in reply to "Re: Damascus bore dimensions?" 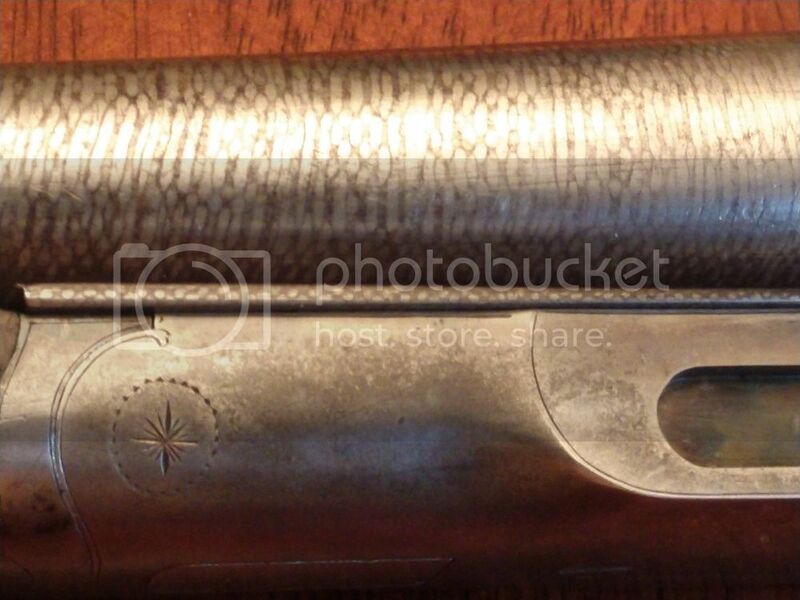 I am going to check some other things to verify bore gauge accuracy and will get back with you the serial # is 43231 and it has the Rueben's Royal type twist. Thanks for sharing your wealth of knowledge. Posted by Drew Hause on November 23, 2018, 9:51 am, in reply to "Re: Damascus bore dimensions?" F grade hammer guns were offered with Twist barrels, then after about 1898 could be ordered with "Royal Steel"
No. 00 hammerless were only offered with "Armour (later Armor) Steel"
Posted by Travis Smith on November 23, 2018, 9:53 am, in reply to "Barrel type?" I am positive you are not confused. I am probably just not using correct terms. I will shoot some pics and post them later today for clearer info. Posted by Drew Hause on November 23, 2018, 10:12 am, in reply to "Re: Barrel type?" Posted by Jent P Mitchell III on November 23, 2018, 11:42 am, in reply to "Re: Damascus bore dimensions?" A setting ring should have come with that bore gage..... Usually the set ring or standard ring is size 0.700 inches at 59 degrees F.... Do you have a setting ring ???.... You can buy them on ebay.....https://www.ebay.com/itm/USED-DIATEST-BORE-GAGE-SETTING-RING-6560/173257852289?hash=item2856f90581:g:ZEIAAOSwVWFayBzO ..... https://www.ebay.com/itm/0-742-X-18-85mm-Master-Ring-Bore-Gage-Gauges-Milling-Set-Up-verification/312171371783?hash=item48aedd1d07:g:w3cAAOSwK-ZbL7w3 ....... posted by Jent on November 23 of 2018. Posted by Travis Smith on November 23, 2018, 4:36 pm, in reply to "Re: Barrel type?" Yes that is what I have. Thanks for straighten me out. Pics below are of the gun I have. I then re-gauged the LC smith barrels. From the breach end past the forcing cone read .720 without any fluctuation. 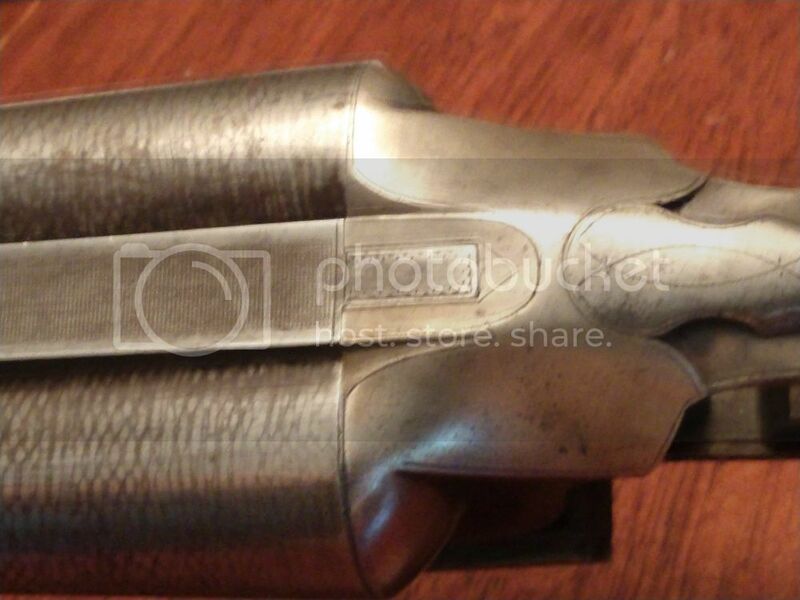 From the Muzzle end past the choke area read .720 without any fluctuation. From the breach end past the forcing cone read .722 without any fluctuation. From the Muzzle end past the choke area read .722 without any fluctuation. I am thinking it would be safe to assume that with these dimensions and the general original wear look of the barrels that they have been untouched in regards to honing, cone lengthening etc.? I am not looking for a confirmation of safety but just some thoughts on originality of the condition. Posted by Travis Smith on November 23, 2018, 4:41 pm, in reply to "A Set Ring Should Have Come With The Bore Gage"
I have a Stan Baker gauge and it did come with the 12 gauge ring (mic'd at .700). Looking at the dimensions of the head on the gauge I do not see any reason it wouldn't also work for 16 gauge. Posted by Bill Schodlatz on November 23, 2018, 7:35 pm, in reply to "Old Damascus Shotgun Barrel Bore Diameter "
Don't forget you are dealing with Yankees who are trying to make a profit. If a barrel doesn't clean up all the pits at .727 should the ultra pure makers pitch them, no way! They over bored them to make a safe usable barrel. Posted by David Williamson on November 24, 2018, 7:25 am, in reply to "Re: Barrel type?" Bores in an L.C. Smith of .721-.722 is unusual. I have found out that in a few of my hammer guns that the bores were.724-.725 and in early hammerless guns were from .727-.729. Whether they did not inspect them and just left them is any one's guess. It could have been a worn reamer. That is why it is important to know bore size when figuring constriction. The gages that you buy to put in the muzzle only tell you that there is choke but not what it really is.